As my Mom used to tell me (while I grumbled and rolled my eyes): “As you grow older, the years will roll by quicker than the last.” Per usual, she was right. There were also highs and lows as we celebrated those who had beaten the odds like my miraculous Aunt Joan and my dear mother-in-law, Pam; and those with whom we lost like Jacob Oaks, a 19 year old SCS graduate who lost his life serving as the Good Samaritan or Paula Martin, a wife, mother of three and amazing businesswoman who lost her courageous battle with cancer. My “word” for 2016 was STEADFAST. This word was drawn from the passage of Psalm 51:10: Create in me a pure heart, O God, and renew a steadfast spirit within me.” That passage has given me not only a compass, but a burning motivation to make 2016 one of the best. Someone very special in my life even gave me a framed version of Steadfast that hangs on my wall in my home office. Among the highlights of 2016: My husband and I celebrated our 20th wedding anniversary. In this day and age, that’s something to crow about! 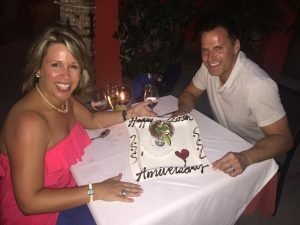 We enjoyed a weeklong vacation in Turks & Caicos in May…half spent on our own exploring the sights and flavors and the second half spent with two of our closest friend with whom we have known since we were 19! 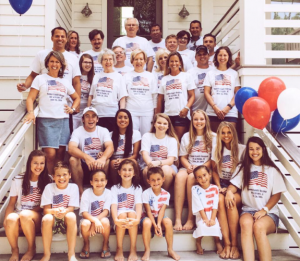 Our family celebrated a huge Family Reunion at the Isle of Palms in July. We ate, swam, laughed, watched old videos, ate some more and shed a few tears! The food was amazing all week and I could not ask for a better extended family! The Thomas clan is one of kind!! For our oldest, Ashley, this was the season of lasts, both on & off the court. Watching her play volleyball since she was 8 years old has been one of my greatest pleasures and honors. 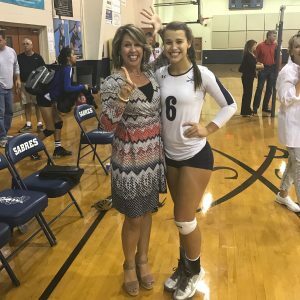 The 2016 senior volleyball season tested her physically and emotionally. I was so proud of how she stayed focused and passionate about her sport no matter the odds. Her team won the 2A Regional Championship title. And this mom will never forget the look and the hug I received at her very last game. You cannot prepare for that moment. You just can’t. She will be attending Lee University in Tennessee this coming fall. And, while the trek up the mountains scares us, we know this is her path! I find that my youngest children, Hannah and Ty, are the ones who truly ground me and force to me try to slow down and smell the roses. They still want to go see the movies or shop with me or simply just hang out and be silly. Those moments are fleeting . On the fundraising side of things, I am thrilled to report that TEAM SAMMIE was the #1 fundraising team for the 2016 Susan G Komen Race for the Cure in the Upstate. We raised over $7000 for breast cancer awareness and research. Making it more special was our Day of the Dead event co-hosted by my dear friends Jennifer Mathews and Brandi Browning. What a night! 2016 marked my 13th year in the business. I had lofty goals and I am so humbled by the success that I have been able to achieve with the support and trust of my clients. Tears rolled down my face just a few short weeks ago when I was officially made aware that I was Greenville’s Number One Realtor (based on 2016 GGAR MLS Sales Volume). Surreal. In hindsight, I reflected on a conversation I had with my Mom in January 2012, just two years before her own passing. After attending C. Dan Joyner’s visitation at First Baptist Church I called my mom as I often would in the evenings to share the day’s events. On this evening, I was more somber than usual yet uplifted by the sheer volume of persons who came to pay their respects for our trusted leader and friend. I also told her how I wished he would be able to see me receive the award as the #1 agent for our Company. Mom said he does see you. I bet he is dancing in heaven right now! Per usual, she was right again! I’m ready to take on 2017! Join Me!